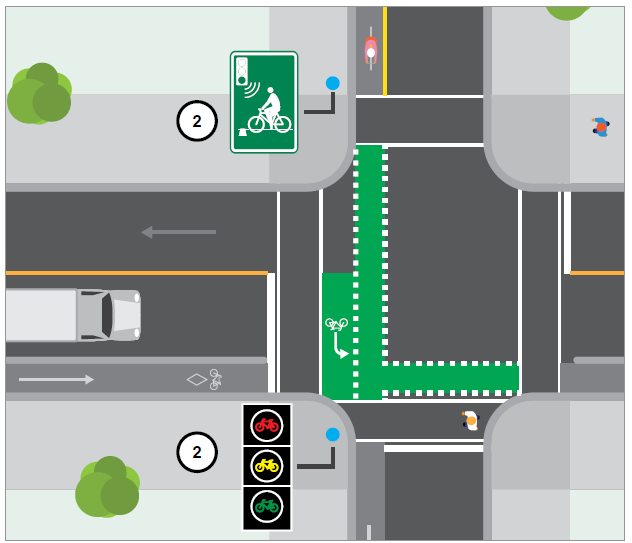 The City of Winnipeg has rolled out new bike infrastructure throughout the city, including new features that will help increase safety and improve traffic flow for Winnipeg cyclists, motorists, and pedestrians. The following guide outlines these new features and how to use them properly. Transit buses load and unload curbside, blocking the bike and vehicle lane. Cyclists and drivers must wait for the buses to load and unload. 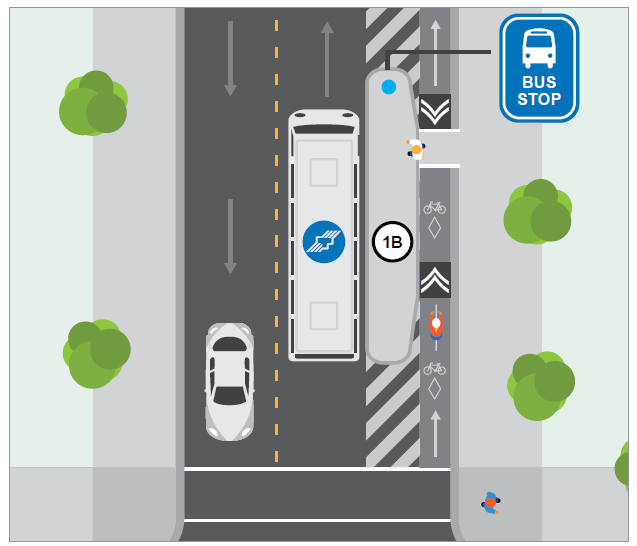 While cyclists are legally permitted to change lanes and pass the bus, the safest option is to wait for the bus. 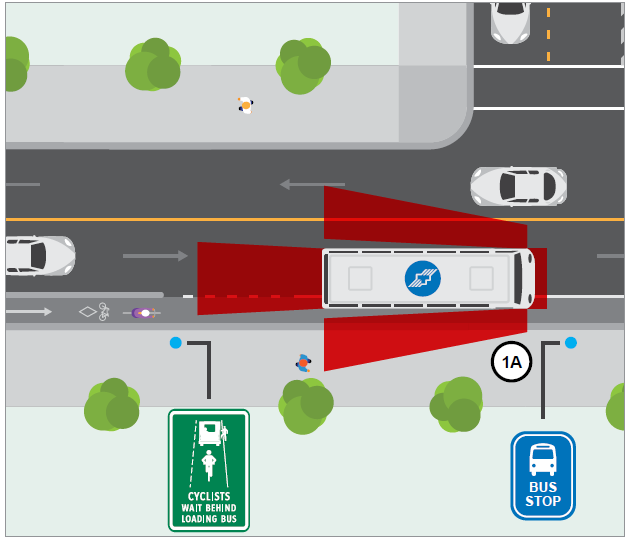 This design allows the bus to continue travel immediately after loading, ensuring minimal wait times for cyclists and drivers. Note the blind spots around the bus. This design provides a protected space for cyclist to bypass buses and passengers while they load and unload. Cyclists and pedestrians must be aware of potential conflicts and be courteous to each other in these areas. Pedestrians have the right of way and cyclists must yield to them when crossing the bike lane. Pedestrians are reminded that this is a travel lane for cyclists and they should not to stand or linger in the bike lane. Some bikeways have dedicated bike signals. These signals feature a bike image instead of the regular ball. Drivers and cyclists must follow their respective signals. Bike signals and vehicle signals often have different timing. Most often bike signals will accommodate a few seconds of lead time to allow a head start. This supports the visibility of the cyclist and reduces the risk of a right-hook collision. Right turns on red are generally not permitted for vehicles in these instances. 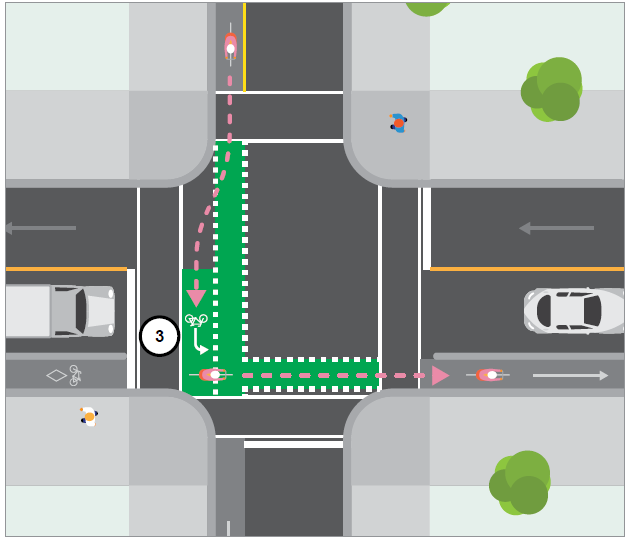 The two-stage turn box provides a formal waiting area for cyclists making a turn from a protected bike lane, usually for left turns. 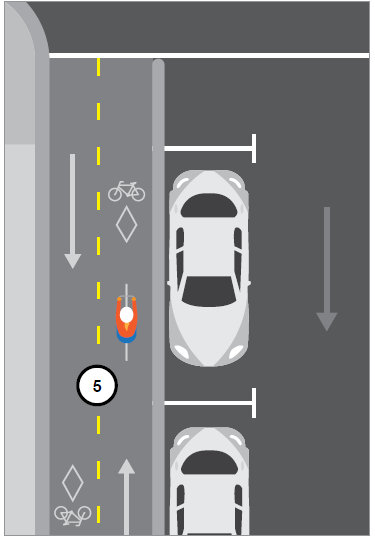 Cyclist must move into the box to wait for a green signal or gap in traffic at a stop sign to complete the turn. Vehicles are not permitted to wait in the bike box area and must stop at the stop line behind it. Right turns on red are restricted at signalized locations where bike boxes are present. Cyclists are permitted to make a two stage turn at any intersection where the cross street has a traffic signal or stop sign, even if no painted bike box exists. Protected bicycle lanes are located within the road right-of-way, but are physically separated from motor vehicle travel lanes by concrete curbs, planters, vehicle parking etc. Cars and trucks are not permitted to drive or park in the bike lane. Sometimes transit buses and handi-transit vehicles are permitted to load in the bike lane. Cyclists must wait for the transit vehicle to load/unload. 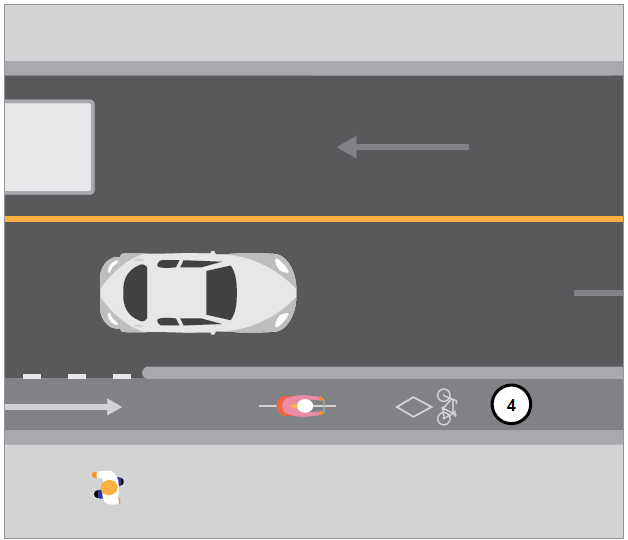 Cyclists must be vigilant when leaving a protected bicycle lane, such as at an intersection, as motorists may not always anticipate or see a cyclist. Signage that reminds motorists that they must yield to cyclists is to be installed at key locations. This is a form of protected bike lane that accommodates travel in both directions for cyclists. 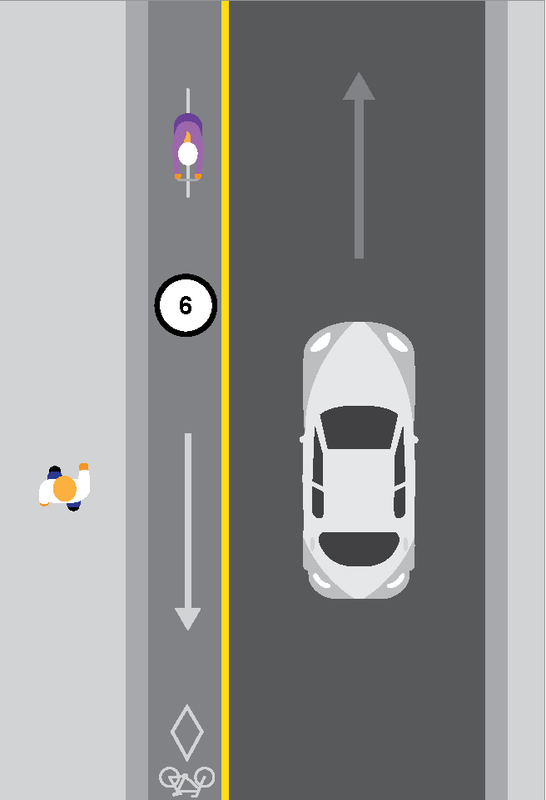 Drivers crossing or turning across the bike lane must be aware of cyclists travelling in both directions. Vehicle turning movements are often regulated by traffic signals.